I hate cooking. No, I should say I really don’t enjoy cooking. I do it. I do it all the time. I’m even good at it. I would call myself a good cook. I am a cook who hates to cook, but I am also a cook who can put a smile on your face. Still I think it is safe to say cooking is just not my thing; it just happens to be a resume builder I have gained while living in survival mode for the past 13 years. When LG and I got married, I cried when I realized that it was my responsibility to feed my husband and future children and it would be for THE REST OF MY LIFE. Cried would not be a totally fair assessment. I bawled one night while cooking, and I continue to cry inside every time I am magnetically stuck in the room of my house that sports a fridge, sink, and stove. Now I know I am gonna hear it from my naysayer our there who believes in women’s rights, but from the get-go, I embraced my control over things inside the home. I more than embraced it. I, for lack of better words, peed over the threshold between family room and teeny tiny studio apartment kitchen, as my way of saying, “hands off man, this is my territory”. The kitchen would be my domain. Man, I was such a fool. LG was more than happy to step aside for food duty, even though we were both working and going to school full-time. And not to my surprise and even to my blame, today the guy only has a handful of choices that he can pull off that involve a wooden spoon and pan, and most of them are in the breakfast category, come frozen, or out of a box. And I am smacking my forehead against my keyboard as I realize how totally stupid I was back then. So, I live with the stubborn hell I have created. I cook. Even when I don’t want to. In the past few years, while there hasn’t been wiggle room in the budget for enough pizza and hamburgers ordered from other people’s kitchens, I have learned many tricks. I have very reliable go-to’s. I keep staples in the house for each recipe. One happens to be french toast. It only takes six ingredients that I usually have on hand. My kids love it and so do I. My husband tolerates it, but if he was more worried about eating his favorites, he might ask me to teach him how to cook them. hint hint. Before I share the flawless recipe, let me tell you two tricks that will make this easy peezy meal turn into 10 easy peezy meals. One, make a TON at a time. Stick them all in a gallon size ziplock. They have lasted for at least a week at my house. Reheat them as needed in a toaster. The other trick is a little easier. Buy the kind of syrup shown above. It’s short enough to be heated in the microwave. French toast are so much better with hot syrup. saving myself $2 a pop. Once in a while I will make my own syrup, which is also very tasty. You can add one last trick if you want. It would be the one where you teach the kids how to wash the griddle. We are still trying to get this one down at our house. Guess what is the best feature of french toast: LG knows how to make it!! Here are my recipes for the sharing. 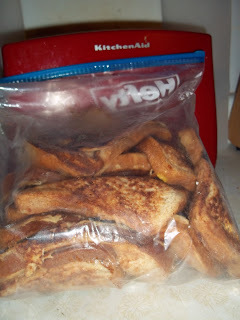 Do any of you have any tips on how you keep your french toast from getting soggy? I am usually 80% successful but not sure how. Beat together egg, milk, nutmeg, vanilla and salt. Heat butter on a griddle heated to medium. Quickly dip bread in egg mixture and transfer to hot buttered griddle. Cook both sides until lightly browned and crisp. Boil together until sugar is completely dissolved. 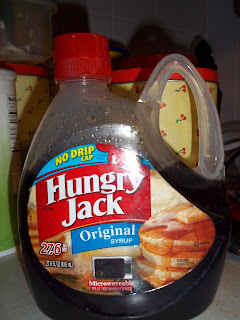 I'm so going to try your syrup recipe. It's sounds good. The only way I've found to keep my french toast fresh is to make it into a casserole. I butter a dish, layer the bread and then pour the milk/egg mixture over it. Sprinkle the top with cinnamon sugar and bake. Then I put a towel over the top to absorb the steam overnight, and it's not soggy at all in the morning! Love it! I am always feeding the “masses” and this will come in handy! You are right about getting your husband to learn how to cook out of the gate. But have hope – mine is learning and feels quite accomplished even at this late date. However, I like to cook. If someone would buy the food – I will cook for them 🙂 The only thing my kids would complain about is if the “new” recipe I would be trying was a dud. They will tell you stories about the Ham and Bean soup I made – then I left for some meeting (it tasted nasty!). My husband insisted that the kids eat their soup. Only when he dished up some for himself and ate it, did he tell the kids they could throw it out. I will never live that one down!!! I am in awe of couples where the husband is equally if not more talented in the kitchen. Most of my married life I have been the only cook in the kitchen… now that the kids are gone Tony loves to cook on his days off… yes I am totally spoiled by his talent. I also have two son-in-laws that are awesome in the kitchen. I just ate this plate of potatoes onions and peppers topped with a wee-bit of pepper jack cheese straight from Gossners in Logan… and even though I am satisfied your french toast sounds yummy!!! I am going to have to give it a go. I am pretty sure I have had your french toast and it is yummy! Try almond extract in place of vanilla, it's yummy!